Today's APOD is an Extra Detail Magnification ("EDM") of yesterday's fantastic Contextual Image (or "CTX Frame", for short) of the Dwarf Planet 1-Ceres, taken by the NASA - Dawn Spacecraft on October, 18, 2015, that shows us, once again and with great detail, one of its most intriguing Surface Features, such as Occator Crater (in an oblique view). This Impact Crater is roughly 60 miles (such as approx. 96,5604 Km) across and about 2 about miles (approx. 3,218 Km) deep, and its the home of some of the brightest Areas (the so-called "White Spots") of 1-Ceres. If you compare this frame with others, always related, of course, to the same Area, you may notice (at least, so we did, as IPF, in our humble opinion and by using our poor means) the occurrence of some - truly small, but visible - changing in the White Spots themselves. Now, as you know, just like we know, 1-Ceres is an airless Celestial Body and, technically speaking, also a "dead" Celestial Body (---> which means that there are no more Tectonic and/or Volcanic Activities - assuming that they ever occurred, perhaps eons ago - inside it). So, if this - maybe questionable - assumption is correct, why the White Spots are (better yet, "seem to be") changing? Maybe the time will tell us. Or maybe not... However, if you wish to discuss this certainly controversial topic, just write us at alphacentauri@intercom.it . Thanks. 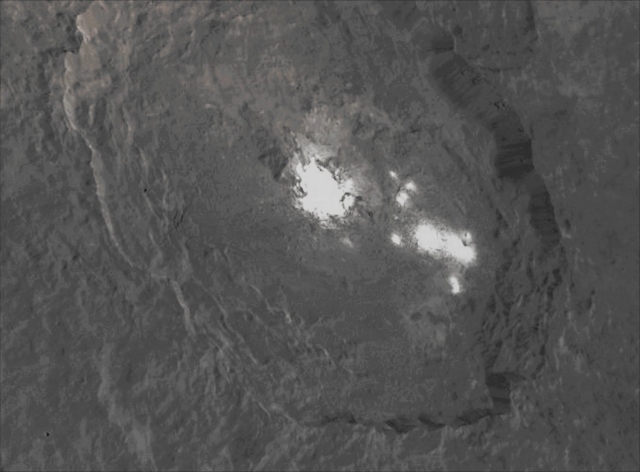 This image (which is a crop obtained from an Original NASA - Dawn Spacecraft's b/w and NON Map-Projected frame published on the NASA - Planetary Photojournal with the ID n. PIA 20132 - Dawn HAMO Image 69) has been additionally processed, extra-magnified to aid the visibility of the details, contrast enhanced and sharpened, Gamma corrected and then colorized (according to an educated guess carried out by Dr Paolo C. Fienga-LXTT-IPF) in Absolute Natural Colors (such as the colors that a normal human eye would actually perceive if someone were onboard the NASA - Dawn Spacecraft and then looked ahead, towards the Surface of 1-Ceres), by using an original technique created - and, in time, dramatically improved - by the Lunar Explorer Italia Team.